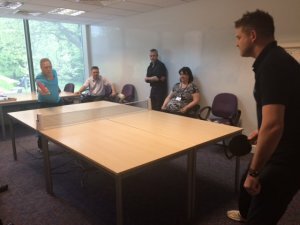 Post Office workers in Chesterfield have been getting active and taking part in a host of activities as part of Workplace Health Week (May 23 to 27). 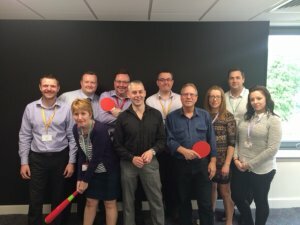 Rounders, table tennis and a #MiddayMile have all proved popular, with staff persuaded to take a lunch break away from their desks. Workers from the Post Office Ltd No1 Future Walk team in Chesterfield have also been logging their activity on the Derbyshire Workplace Challenge website, with competition between colleagues hotting up and proving to be an added incentive. 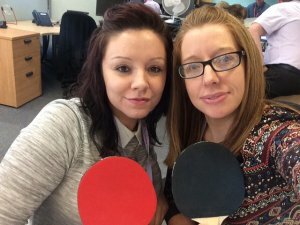 "People loved the table tennis and already want another tournament," said Stacey Beresford, who organised the week's activities. "Table tennis is more of an unusual sport and so it appealed to people who don't usually get involved, which is what we were aiming for really. "It was also something which was really easy for people to pop in and out of and have a go without necessarily needing to get changed or bring in their own equipment. We just booked out one of the larger meeting rooms, put some tables together and put up a net. "We wanted it to be accessible and friendly and it was a lot of fun." "We had a knockout format which got really quite competitive, and it also got people mixing who don't normally get the chance to chat and got people active who normally stay at their desk over lunch which was great," added Jenny smith who also helped organise the weeks activities. A group from the office also took part in a #MiddayMile, walking two laps of the nearby Queen's Park, and there was also a hugely popular lunchtime rounders tournament – with people keen to then get back to their desks to log their activity on the Derbyshire Workplace Challenge website and see their names rise up the online leaderboard. Due to the popularity of the activities there are plans to set up a regular walk/jog/run workplace group, with a choice of one, two or three-mile routes, as well as organising more tournaments. "It would be nice to be able to do something each week," said Jenny. "Hopefully the buzz around the office will continue and more people will be encouraged to join in."